Find a top-rated specialist in family medicine at North Shore Medical Center. As the largest health care provider on the North Shore, North Shore Medical Center (NSMC) offers excellent options for families seeking a specialist in family medicine. NSMC physicians include family medicine specialists, who provide primary care for all members of a family, from infants through adults. In addition to offering annual checkups, vaccinations and age-appropriate screenings, a specialist in family medicine can diagnose and treat a broad range of conditions and refer patients to another specialist for treatment. NSMC has nearly 40 family medicine specialists practicing at locations throughout the North Shore. Many NSMC family medicine specialists offer extended night and weekend hours. The many benefits of choosing an NSMC specialist in family medicine. A family medicine specialist offers distinct benefits to families seeking a primary care physician. This model of medicine is based on the general practitioners of the past – doctors who provided general medical treatment for every member of the family. A specialist in family medicine can develop an extensive grasp of family health history and family dynamics, allowing him or her to provide more insightful treatment. Many families also appreciate having a single point of contact for all medical visits, as well as the convenience that a specialist in family medicine offers. Adults who are caring for children or aging parents can schedule multiple appointments at the same time. And for teenagers who have outgrown their pediatrician, a specialist in family medicine is a great primary care option. Alternatives to a family medicine physician: internal medicine specialist or pediatrician. Pediatric primary care doctors treat infants through adolescents and teenagers. They offer well child visits, same day sick visits, and provide required immunizations, physical exams, early periodic screening development tests, and comprehensive health services. When patients require additional care, pediatric primary care physicians at NSMC work closely with the specialists at MassGeneral Hospital for Children at North Shore Medical Center and the Boston pediatrics department of Mass General Hospital to give patients access to world-class treatment. 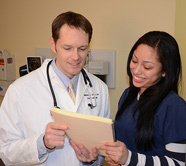 Internal medicine physicians provide primary care for adults. Specialist internal medicine physicians offer physical examinations, preventative care and routine health screenings, and can diagnose and treat a broad range of illnesses. Find family physician options now. You may also use our Find a Doctor search to find another type of physician for a specific procedure, such as a gastroenterologist for gastroenterology treatment, a cardiologist for heart examinations, weight loss specialist for a gastric sleeve procedure or an oncologist for cancer screening.